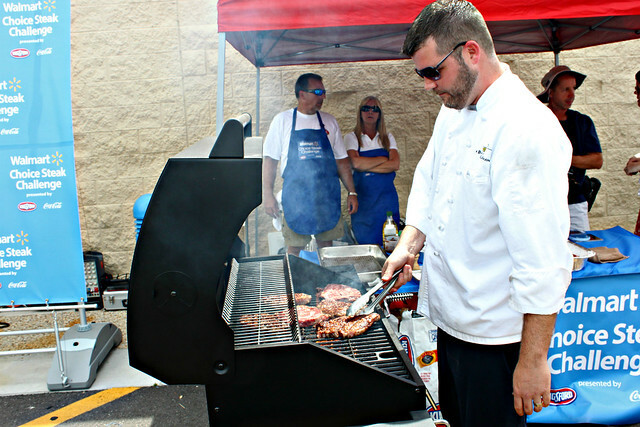 A couple of weeks ago I was invited to the Walmart Choice Steak Challenge presented by Kingsford Charcoal and Coca-Cola. Tampa has been selected as one of eight markets to be selected for this challenge taking place in Walmart parking lots nation-wide. 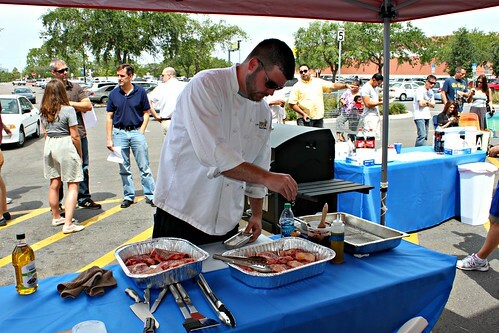 At the Tampa event, our very own Chefs Chad Johnson from Bern's Steak House and Eric Lackey from Flamestone Grill competed to determine who has the best steak-grilling skills in town. 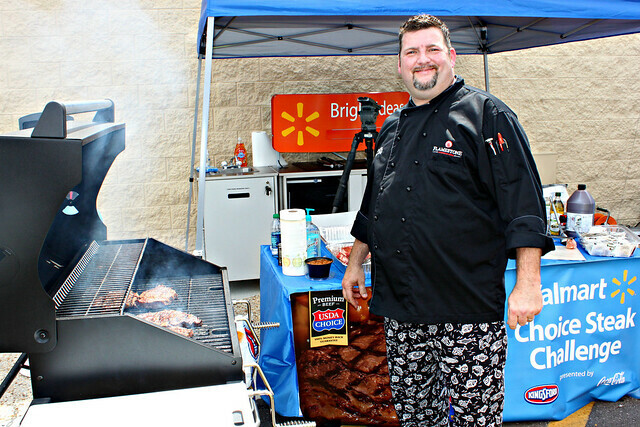 Walmart shoppers judged the Walmart Choice Premium Rib Eyes prepared by the chefs. 1. Drink beer while grilling. Seriously, this was their #1 tip and personally, I find it to be a good one! 2. Don't puncture the steak. 3. Create both a hot zone and a cool zone on your grill. To create the hot zone, position the coals 6 inches below the top of the grill. The hot zone is great to finish off your steak once it has been cooked almost to the way you want. 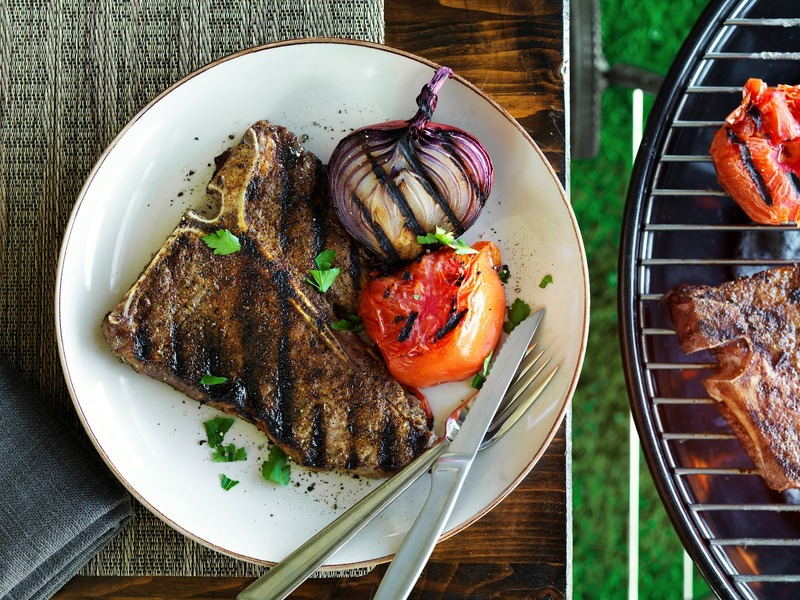 The cool zone would be an area where the coals are 10-12 inches below the top of the grill and is great to have when a steak seems to be cooking too fast. A chimney is recommended so the coals burn evenly. 4. For a simple marinade, just leave your steak in olive oil for 15 minutes before grilling. The olive oil really allows the steak's natural flavors to shine through. Myth #1: Start cooking your steak at room temperature. Busted: Actually, it's much preferred to start grilling your steak right after you take it out of the fridge. Myth #2: Poke the steak for the marinade. 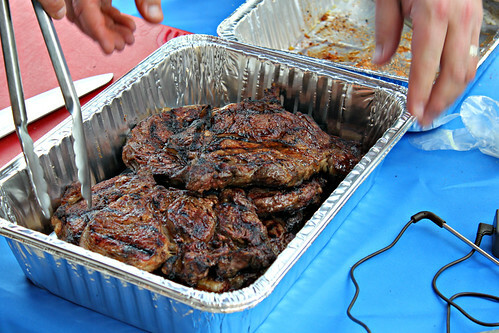 Busted: It's better to not puncture the steak as punctured steak on the grill will allow the natural juices to seep out. Myth #3: Only flip steak once so you cook once on the front and once on the back. Busted: The chefs recommend you flip your steak multiple times. In fact, a minimum of 4 flips is great. After chatting with the chefs, the event was underway! Chef Eric Lackey from Flamestone!! 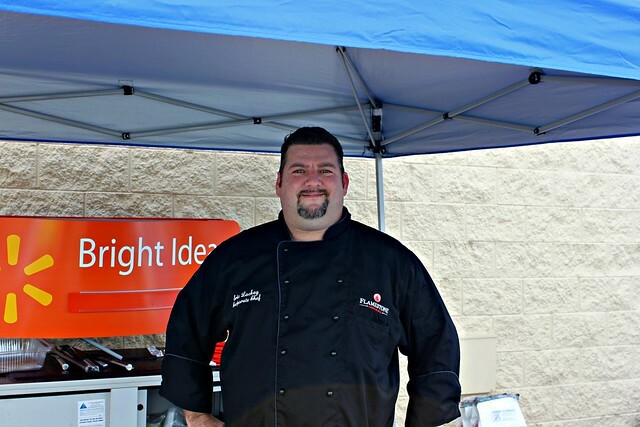 Chef Eric will now move on to compete in New York, along with seven other chef finalists, on May 22nd! Good luck to him! We will definitely be visiting Chef Eric at Flamestone when he gets back from New York. 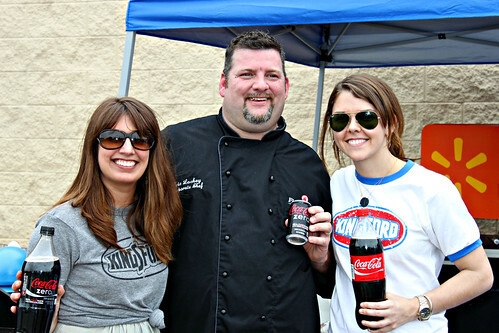 Prior to the event, the chefs cooked up some delicious grilling recipes that Kingsford graciously shared. All photos and recipes are courtesy of Kingsford. I'll be sharing one recipe now and 2 more at a later date. 1. Leave ends on onion (can trim) and cut in half. Peel away paper-like skin. Place in food storage container. 2. Mix Coca-Cola and vinegar. Pour soda-vinegar mixture into food storage container with onion. Add as much hot water as needed to submerge onions. Marinate overnight in fridge. 3. 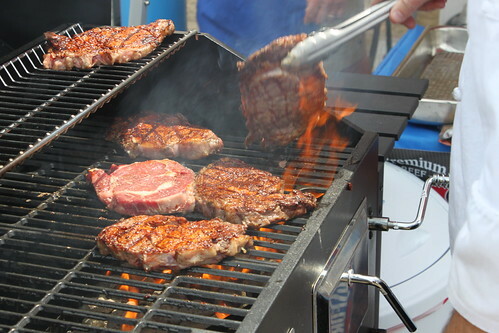 Preheat the grill using Kingsford charcoal, until briquets are consistently ashed over. 4. 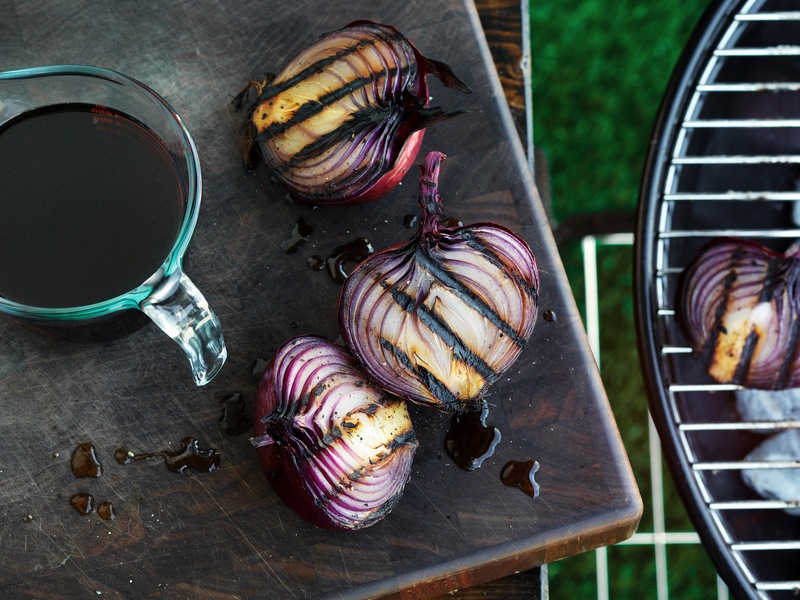 Remove onion with marinade from fridge and grill onion for 20 minutes on medium heat, turning occasionally. Before removing from grill, find hot spot to char onion and caramelize natural sugars for a few minutes to finish. Also, thanks to Kingsford, I have some koozies and hats to give away! Leave a comment below if you want a koozie or hat and I will give them away until I've run out. I never turn down a free koozie. Hubby would love a hat! : ) Thanks for the grilling tips. I am so intimidated by making steak for some reason. I always used to puncture my steaks when marinating them; no longer! Thanks for the tips! I'm going to have to try tip number 4! I agree with the steak flipping hint. Perfection of steaks should be a goal for every griller! And thanks for all the other hints too.